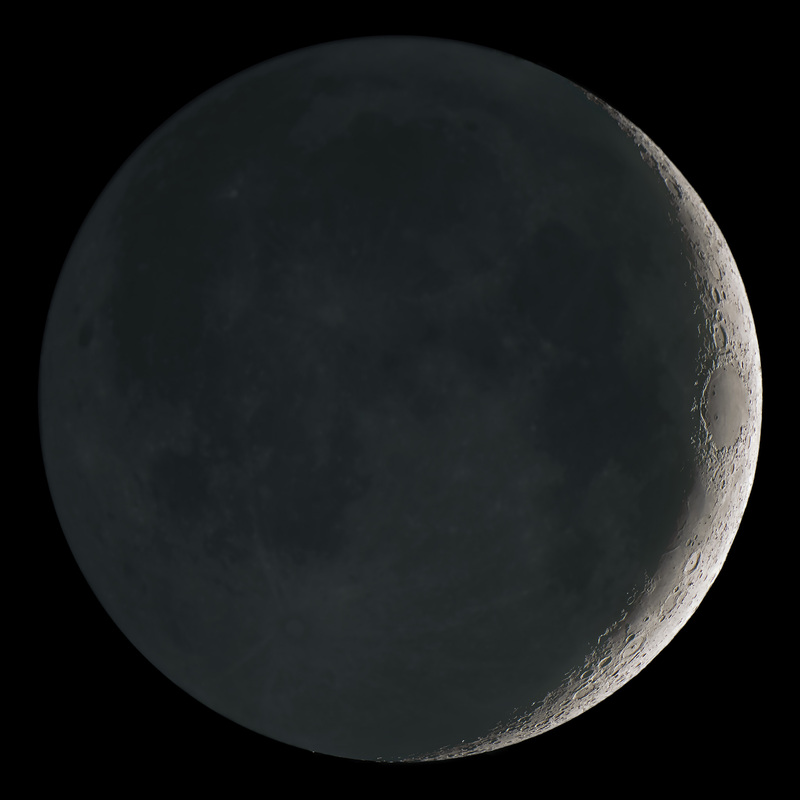 The crescent Moon with earthshine is an inspiring site in the night sky. 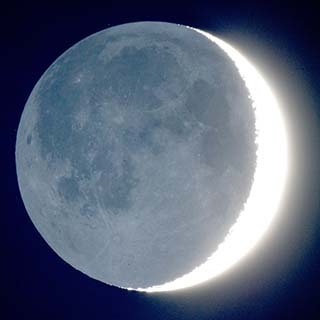 Earthshine images that capture the beauty seen by eye or through a telescope are rare. The extreme range of light and glare from the lunar crescent make it difficult to capture, with a camera, what the eye sees. Conventional High Dynamic Range (HDR) techniques require many exposures and careful processing to give good results. 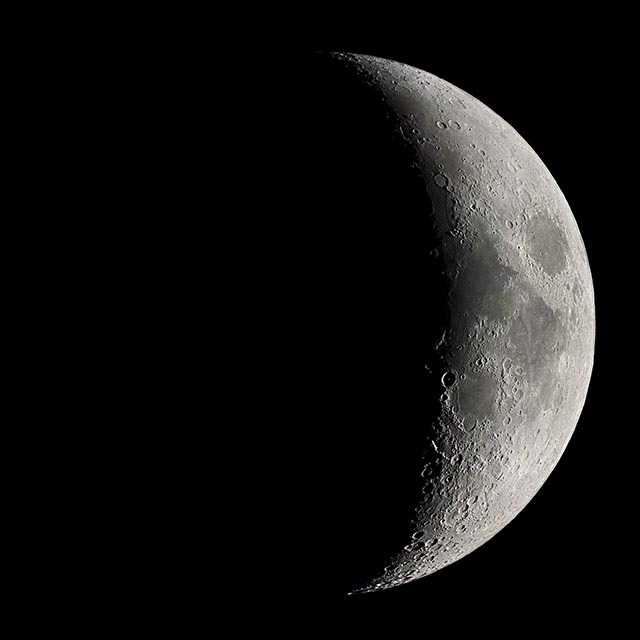 A simple technique, day-lapse earthshine imaging, produces stunning images of the Moon. Earthshine detail, right up to the terminator, duplicates the view of the eye through a telescope. This is done using just two exposure settings. Our eyes can see a larger range of light than the best cameras. HDR photography captures details in highlights and shadows. Multiple images taken at different exposures capture a scene’s full range of light. Post-processing merges the images to produce a single HDR image without over or under-exposure. A typical daylight terrestrial HDR image includes three exposures taken about a stop (2X) apart to capture details in shadows and highlights. The Moon with earthshine is very challenging to the HDR photographer. 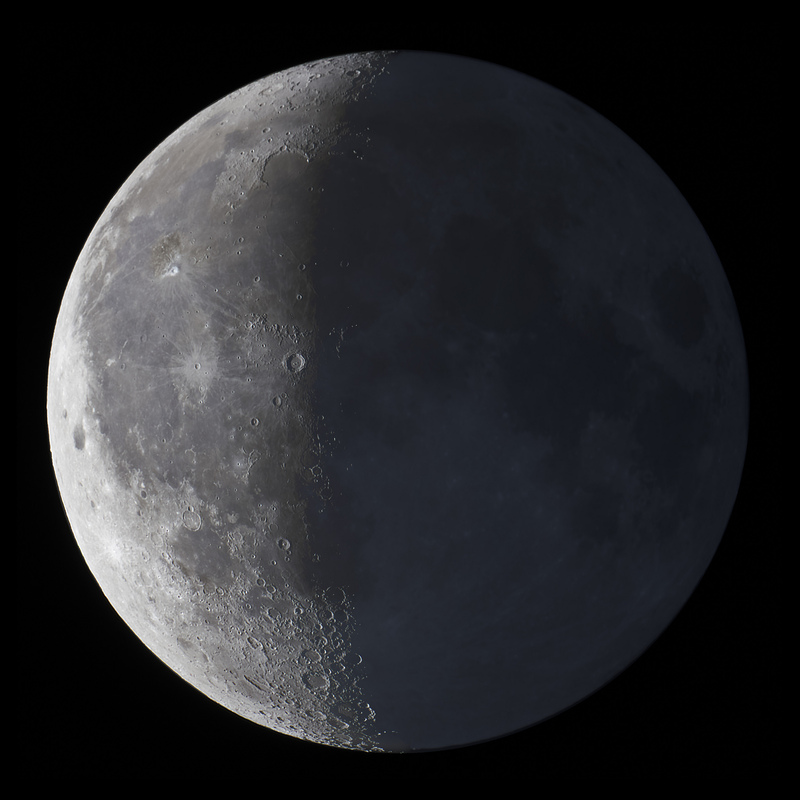 The sunlit portion of the Moon is bright and can be captured well by a single camera exposure. The rest of the Moon is dimly lit by earthlight, sunlight reflected from the Earth to the near side of the Moon. Because the Moon has no atmosphere, the terminator dividing lunar day from night is sharp. The difference in light levels between the crescent and earthshine is 8 to 10 stops (1000X). Taking just two exposures 8 to 10 stops apart and combining them into an HDR image doesn’t work well. The earthshine exposure above is spoiled near the terminator by glare from the badly overexposed crescent. A cropped HDR composite with the crescent exposure included (figure below) shows two problems: glare from the bright crescent and a shift in the apparent location of the terminator. This shift in the apparent location of the terminator is due to the very low angle of the Sun near the terminator. This dimly lit area along the terminator is dark in the short crescent image exposure and overexposed in the earthshine image. 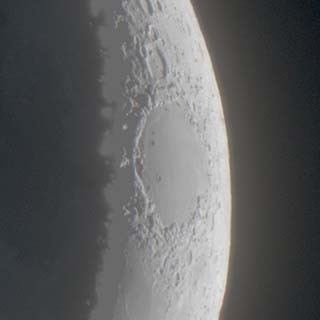 This region is often painted out in earthshine images. The image looks better, but any detail in this part of the Moon is lost in a grey blur. Increasing the number of HDR exposures (8 or more are needed) can capture detail in this region of low angle sunlight. Many more exposures at different settings make this more difficult to shoot and process. Reduced contrast because of glare from the crescent is still a problem in HDR images with many exposures. Other techniques used to improve image quality require even more exposures. Lucky image stacking combines the best of multiple images of a target to reduce noise and increase contrast. If we improve image quality by image stacking, many hundreds of images must be taken. Using a video camera speeds up the exposures at a cost. Video gives lower resolution images or requires even more images to stitch together into high resolution mosaics. The earthshine photographer needs techniques that can capture the whole lunar disk, with high resolution, and require the fewest possible exposure settings for HDR. DSLR or mirrorless cameras with APS-C or larger sensors are a good match for capturing the full Moon in a single exposure with most telescopes. A night’s rest provides an simple solution to the many exposures problem… The terminator advances about 12 degrees across the Moon’s face each day. We only have to add delay between exposures. With enough delay, the detail hidden by glare and terminator shift is revealed by the advancing terminator. A day or two wait between just two exposures is enough. With only one exposure setting needed per night, it’s easy to take extra images for lucky image stacking. Detail in the earthshine will always be softer and lower contrast than in the crescent because of the dim, diffuse lighting from the nearby earth. Craters, highlands, and maria in the earthshine area are visible right up to the terminator in day-lapse earthshine images. They closely match the beauty of this scene in a telescope eyepiece. Some fine points require attention. The apparent size of the Moon changes slightly because of distance changes due to its elliptical orbit around the earth. 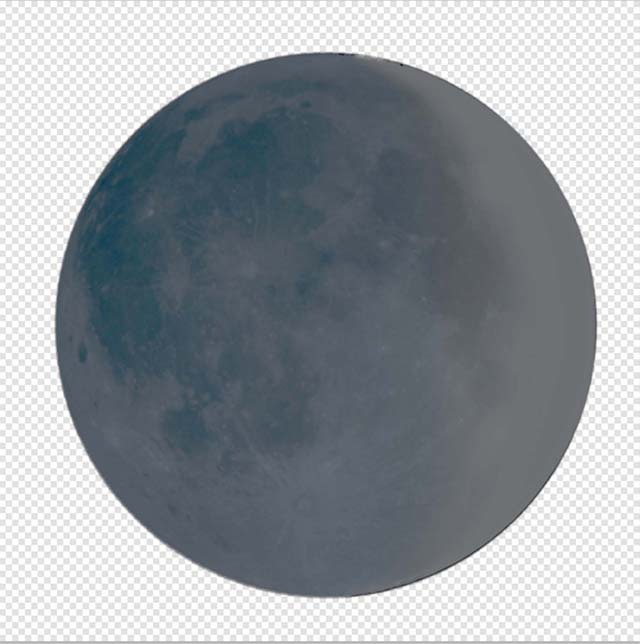 The portion of the Moon that we can see changes slightly because of the tilt between Earth’s rotation and the Moon’s orbit. Libration changes our perspective because the Moon’s orbit is tilted with respect to its axis. A small change in the Moon’s size is easy to correct during alignment. Large perspective changes cannot easily be corrected. With only a day or two delay, they can be corrected by aligning and transforming the earthshine layer to match the crescent layer features along the terminator. Corrected, small size and perspective changes are too small to see in the final result. 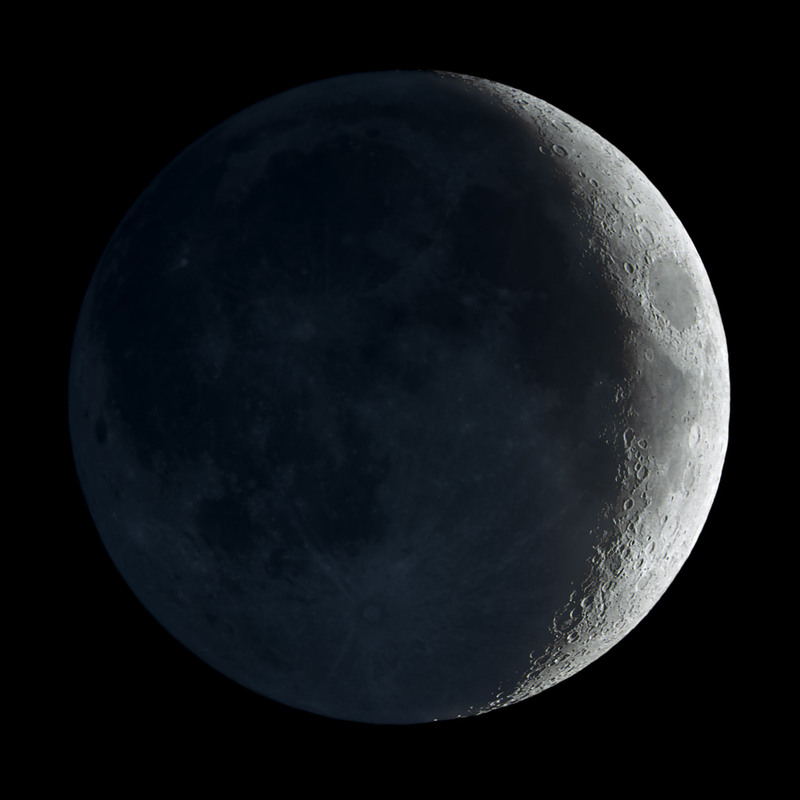 For a waxing crescent take the earthshine exposure on the first day, for a waning crescent take it on the day following your crescent exposure. There are too many software tools for processing HDR images to give details for each. Adapt these suggestions from my processing workflow to your own tools. If you stack multiple images to improve the image quality, you need to deal with atmospheric seeing. The Moon has about 1/2 degree of apparent size. Variations in atmospheric seeing result in mirage-like distortions across the Moon. This makes lucky image stacking more difficult for full-disk Moon images than for lunar close ups. Align images using a stacking tool that corrects for geometric distortion. I use Nebulosity's non-stellar automatic alignment, with 8 parameter affine transform, very successfully. Alignment is slower, but the results are worth the wait. Three layers are needed for two exposure HDR image merging in a layer based editor like Photoshop. The background layer is black. Lunar detail and background stars are picked up from the top two layers. 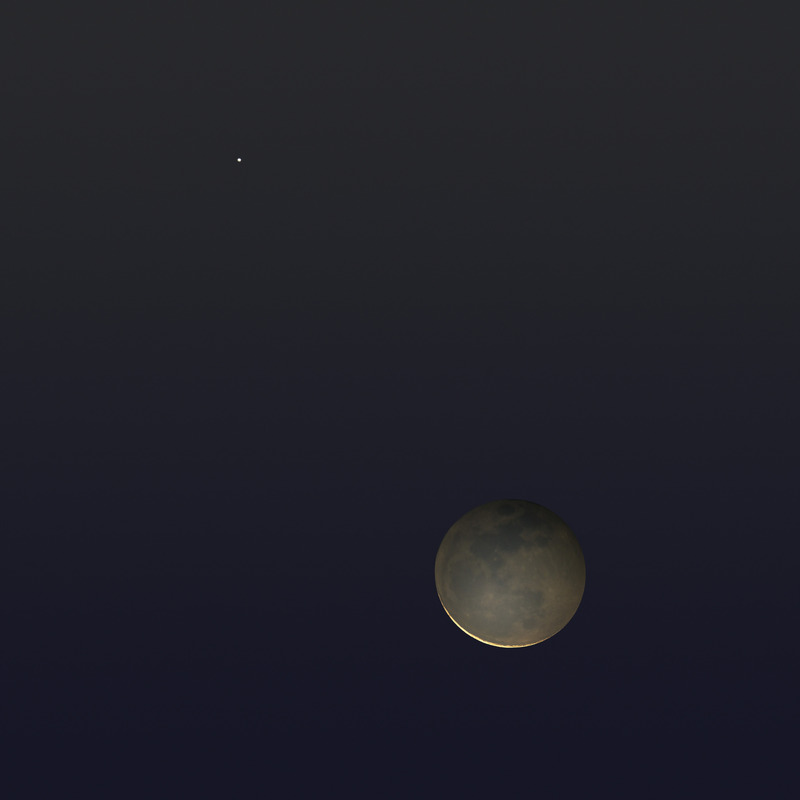 The earthshine layer is next; masked to include only the lunar disk shown. On this layer, I select the overexposed crescent area, and clone color sampled from the earthshine region. This will insure the correct level of earthshine illumination in the terminator and crater shadows in the brightly lit crescent. The top layer is the exposure for the sunlit lunar crescent shown below. The earthshine layer must now be translated, rotated, and scaled to align to features on the crescent terminator. The final HDR merging is done by setting the top crescent layer to "lighten only" merge. The final balance between crescent and earthshine illumination is achieved by adjusting each layers exposure individually. The final result below captures with fidelity the appearance of the Moon in the eyepiece when the crescent image was made. This image was made with small, light equipment, an 89mm f14 telescope and a 16 megapixel mirrorless APS-C camera at prime focus. The earthshine layer was exposed for 2.5 sec at ISO 800 with 14 frames stacked. The crescent layer was exposed 2 days later for 1/15 sec at ISO 200 with 9 frames stacked. Compare this day-lapse image with these exceptional images made using conventional HDR techniques: Jerry Lodriguss's two-day old waxing crescent Moon and Dylan O'Donnell's March 20, 2015 Astronomy Picture of the Day. Try this day-lapse technique with your own images and tools. Problems from glare and camera limitations will be gone. You will soon be making great earthshine images that capture the beauty of the scene as you see it through the eyepiece. Mercury and earthshine on the Moon revisited with better alignment and color, a HDR Mosaic from Austin, Texas at 2015-10-11 11:50 UT. Made from four exposures: a wide field alignment image using iPhone 6s and the Questar 4x finder. Detailed images Questar 3.5" with Sony NEX-5N at prime focus at ISO 800. Moon crescent stack of 25 1.0 sec, Moon earthshine stack of 4 15 sec, Mercury stack of 20 1.0 sec. exposures. Processed in Lynkeos, Nebulosity and Photoshop. Here are some more examples of the day-lapse technique. The image below was awarded 2nd place for the Astronomical League 2017 OPT Solar System Imaging Award. Crescent Moon from Austin on 2017-01-31 01:02 UT. Questar 3.5" telescope (1350mm f14) and Sony a6300 camera at prime focus. A day-lapse HDR image. Crescent exposed 1/25 sec at ISO 400. Best 8 of 105 images stacked in Nebulosity. Earthshine exposed on 2017-01-30 00:55 UT for 5 sec at ISO 400, best 16 of 30 images stacked in Lynkeos. Deconvolution in Lynkeos with HDR composition in Photoshop. HDR new 4 day old crescent Moon with the old Moon in the new Moon’s arms from Austin Texas on 140830 1:42GMT. Questar 3.5 and Sony NEX-5N, ISO 400 new Moon 1/3 sec, old Moon 20 sec. Sharpened in Lynkeos, NR in Nebulosity, HDR composition in Photoshop. Other astrophotographers from around the world are now using the day-lapse technique as well. Here's an example from Roch Lévesque. If you post any of your day-laps images, tell me about them, and I'll include them here.